Baby Frame Decals – PopTalk! A New Tradition In Nursery Decor! Decorating for a new baby is so much fun! 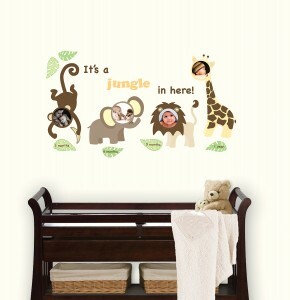 Nursery decor gives you a wonderful creative outlet to welcome a new baby with love. This room will form some of baby’s first memories, the first colors and shapes that she is able to focus on, learning about the world around her. A nursery should be a balance between soothing and playful, the place where baby sleeps but also where baby plays and laughs. Soft lighting can be a wonderful way to welcome a peaceful respite. Whether you install a dimmer switch, forgo overhead lighting entirely for lamps with soft wattage, or decorate with a darling baby chandelier, warming up the lighting in the room is a great start. Wall decor in a nursery is also very important! Pictures, wall decals, mirrors, and fun colors will give baby’s room personality. Peel and stick baby frames are the newest trend in nursery decor! These frame decals allow to your create a rotating display of baby photos as your baby grows. The It’s a Jungle in Here and Forget Me Not frame decals make for an adorable way to showcase baby’s first year, providing frames for baby photos at 3 months, 6 months, 9 months, and 1 year. You can make a whole salon wall of family photos for baby to admire without any nails or screws with the colorful Jonathan Adler frame decals, or display your childs artwork with ease. Simply peel and stick these reusable frame decals to create a customized look, one that is easy to change as baby grows. In addition to being a beautiful nursery decor idea, showcasing your little one’s artwork, and displaying photos of your child, will help foster a sense of pride and confidence. WallPops frame decals are an adorable nursery decor idea that also make perfect gifts for expecting parents! Paint a Filing Cabinet Fabulous & Finish it With WallPops!